Figure A4. 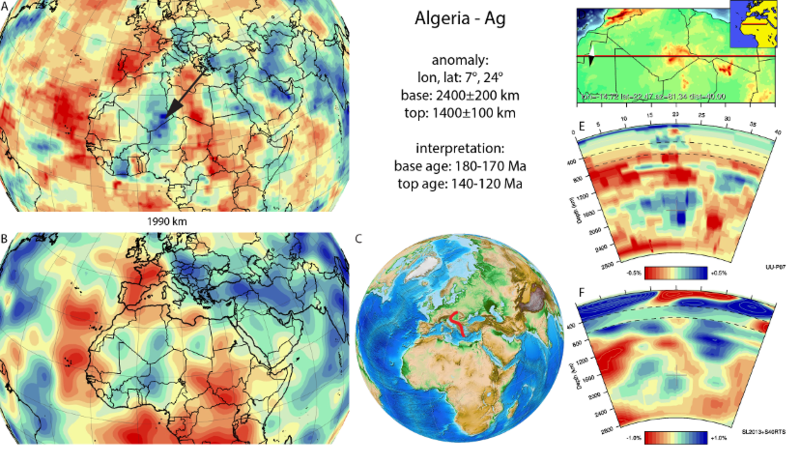 Algerian anomaly, interpreted as the Algerian slab, with (horizontal) [vertical] cross sections through (A)[D] the UUP07 p-wave) and (B)[D] the combined SL2013 and S40RTS s-wave models at 1990 km; C) the location of the modern geological record that we interpret to have formed during the subduction of the slab. is a detached slab located below NW Africa and the Mediterranean from the deep mantle up to mid-mantle and was first described by van der Meer et al. (2010). The neighbouring base of the Emporios slab and the N-S trend of the Algeria anomaly is used to infer that it is the best candidate to represent eastward subducted lithosphere below the West Vardar ophiolites sensu Schmid et al. (2008), found from the Pannonian Basin to southern Greece over a reconstructed distance (e.g., Maffione et al., 2015a) similar to the N-S length of the Algerian slab. The slab is interpreted to represent oceanic lithosphere that was attached to Adria and that subducted below these ophiolites. This lithosphere was referred to as the Meliata-Maliac ocean by Stampfli and Borel (2004). The onset of subduction below the West-Vardar ophiolites likely shortly predated the cooling of metamorphic soles below the west-Vardar ophiolites of Greece, Albania and the Dinarides, dated at 174-157 Ma, by several million years (Dimo-Lahitte et al., 2001; Liati et al., 2004; Karamata, 2006; Šoštarić et al., 2014): we consequently interpret the Algeria anomaly as a slab with a 175±5 Ma age for the base. Obduction of the ophiolites onto eastern Adria, currently in the Dinarides-Hellenides was shown by sedimentary overlap assemblages in the Dinarides and Hellenides to have finalized in the early Cretaceous, around 130±10 Ma (Schmid et al., 2008; Scherreiks et al., 2014; Tremblay et al., 2015; Maffione et al., 2015a), which we take as the age for the top of the slab.